I'm trying to figure out how thats possible... it must have a trailer hitch carrier under it...!? He should have painted the top of the casket white!!! 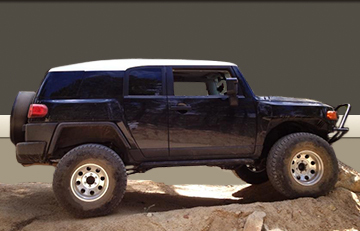 The all new Toyota FJ Cruiser....Now with seating for 6! "So you want to order an OME lift? Do you have after market bumpers?.........What do you mean sort of?.........Okay, you're gonna want the heavies in the rear." I believe that the purpose behind this is after the crushing of Hummers and a place for them to go to rest. With Gina on here you didn't think I was going to say Jeeps did you? Actually be quite comfortable...wake me when we get to Moab!!!! And not a problem for snorers.